In 1838 William and Elizabeth Collins and their seven children arrived in Sydney from Kent, England. In 1839 they settled at Deepwater in the New England district. 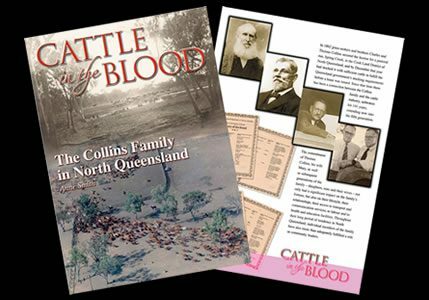 Their sons Thomas and Charles then moved to Queensland, where in 1862 they took up Spring Creek from which five successive generations have built vibrant cattle enterprises, and in so doing have been closely identified with the evolution of Australia’s beef cattle industry and its coming to global pre-eminence. In the process the family has been at the forefront of industry progress whilst members have been prominent in industry organisations and played distinguished roles in community service. In the eulogy to the late Stan Collins OBE in 1992, he was described as “a man who remained steady even under the most trying circumstances, he was the embodiment of all that is desirable in a good citizen, husband and father.” From my associations with the Collinses, I know that the same tribute is applicable to the family as a whole. Stories such as theirs represent classic sagas of resolute men and women who daily faced unimaginable challenges and succeeded against seemingly insurmountable odds. They were the doctors, nurses, teachers and mentors in family values to new generations of Australians, and created industries on which the nation’s vibrant economy was founded. At the same time there was emerging a new literary and artistic culture which has helped define the unique Australian character. It is important that the story of the Collins family and others like them be recorded, as it has been they, together with indigenous Australians from an ageless past, that have formed the fabric of the nation’s history. The author of Cattle in the Blood has rendered signal service by enabling those privileged to read it to better understand the debt we owe pioneering families and their future generations for the national prosperity and life styles we now enjoy. It was to honour such people that “2002 – Australia’s Year of the Outback” was created.